The 2018 Graduation season is behind us. There are some announcements on our fridge. We have sent some congratulations cards. I even had the opportunity and privilege to emcee my church’s homeschool graduation ceremony! It was a blast except for the part where I was 15 mins. late since I had put the wrong start time on my calendar…very embarrassing. Most of those high schoolers are off to college. In the course of financial coaching and counseling, I often encounter questions about saving for college. Parents naturally love their children and want to give them the best educational opportunities they can. Most want to put something aside for their retirement and also for their children’s education, but they often find it difficult to do so. So the big question is “should I save for retirement or my children’s college”? The Bible has much more to say about parents’ responsibility to discipline their children than it does their other duties (Prov.13:21, 24; 19:18, 23:13; 29:17, 1Tim.3:4). The verse I could find that seems to address financial responsibilities specifically is 1Tim.5:8: “But if anyone does not provide for his relatives, and especially for members of his household, he has denied the faith and is worse than an unbeliever.” (ESV). And if we look at this verse in context (verses 3 thru 8), it actually seems to be speaking mainly about how we are to care for the weakest and most vulnerable in our midst (widows and orphans). This doesn’t mean that it can’t have broader implications (I think it does), but we would be wrong to assume that it means that parents have a biblical obligation to pay for all of a child’s education. It is a blessing if God gives you the means to do so, but it is not a biblical mandate. It is a gift of love, kindness, generosity, and provision that no child should take for granted. As I have noted in other articles, the average couple will need at least 60 to 80 percent of their pre-retirement income in retirement. According to Fidelity Investments, a couple making $80,000 a year will need to have about 10 times their salary saved by age 67, which is $800,000. Such a large a figure may be unreachable by many, even without any saving for college expenses. Starting early and saving regularly will give you the best chance of success. College costs are also significant and rising. The chart below, which is based on college expenses as of 2015, shows how college expenses are expected to escalate over the next two decades. 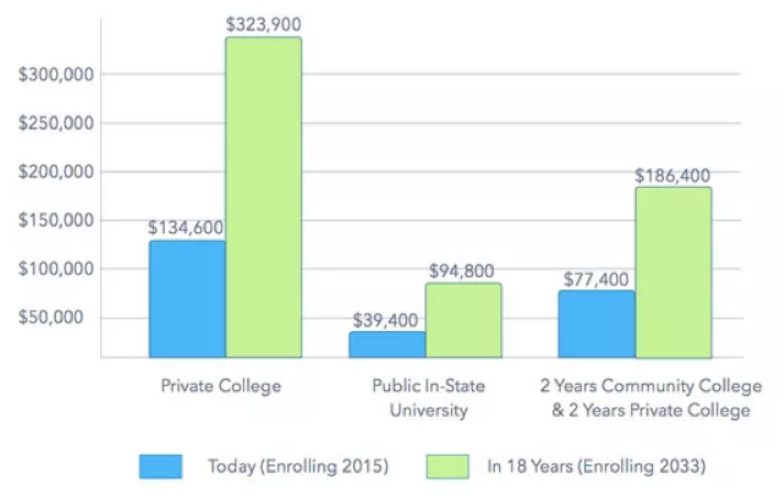 In-state tuition costs are expected to more than double over the next 20 years. I am not a big fan of borrowing for college, but for many, it will be unavoidable. According to the Student Loan Report, the average debt of a college graduate in 2016 was only $17,126 (I say “only” because I expected it to be much higher). I once worked with a single mom who was a teacher who had amassed almost $150,000 in student loan debt, mainly due to attending high-cost private colleges. This was an extreme case (and most concerning given her limited earning potential as a public school teacher). In fact, less than 10% have debt over $100,000, and the majority of those students went on to pursue advanced degrees. Given the challenges that funding a child’s college education present, I am going to try to address some fundamental questions about finding the balance between saving for retirement versus college education for your children. Should I save for retirement or my children’s college education? For most parents, the answer is probably “both.” But for a moderate single-income family of four that is paying a tithe and saving 10 percent for retirement, it can be tough to have something left for a college savings fund. If this is indeed an “either/or” decision for you, I would answer this question with another one: “If you don’t save for your retirement, and your children go to college on your dime so that they can get good jobs with nice salaries and benefits, are they going to take care of you in your old age if you are unable to take care of yourself”? I know that sounds a little sarcastic, but I am serious. I think most of you would answer, “no, probably not, nor would I want my children to.” If that’s the case, then you may want to think twice about foregoing saving for retirement to send junior or sissie to State U or a more expensive private university if it costs your retirement saving to do so. Most parents probably want to do both. In Dave Ramsey’s Financial Peace “Baby Steps,” he suggests saving for retirement (Baby Step #4) before saving for your children’s education (Baby Step #5). Not surprisingly, he also takes a pretty strong stand against taking on student loan debt. I think Dave’s advice is sound. 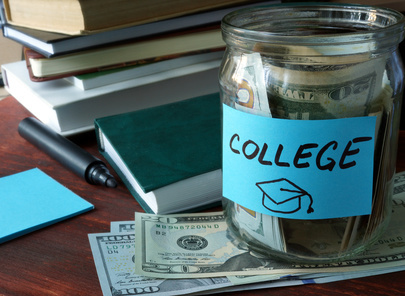 Parents should consider saving for college as optional; retirement savings are more important. If you delay saving for retirement until your children’s college is fully funded, you may not have enough to be able to retire with dignity. Should I take money from my retirement savings to pay for my children’s college education? According to a 2015 Sallie Mae study, only 6 percent of parents withdrew from their retirement savings, either from a 401(k) or IRA, to pay for college. That’s not a large number, and there are reasons why. According to IRS rules, you can withdraw funds from an IRA to cover educational expenses before age 59 ½ without having to pay the 10 percent withdrawal penalty, but you will have to pay taxes of the money is withdrawn from a Traditional IRA. Roth IRAs can be used tax-free. In either case, the money is no longer sitting in your account and growing (via compounding) for retirement. If I can’t afford to save, should I just accept that my children will leave college with some amount of debt? This is a harder question. We have to remember that while the Bible discourages debt, it does not prohibit it explicitly. So it’s not a sin to borrow for college, but the borrower is a slave to the lender. A significant student loan debt can financially hamstring a young adult for a long time after they graduate. Student loans are an option, and you could undoubtedly borrow money for a less important reason. Investing in a college education can pay big dividends later in life. I have talked with college students in my church (and also taught a personal finance class for them). One of the things I talk about is making the cost of college proportional to the earning potential of the degree they expect to receive. The example above (the school teacher with $150K in debt) is a good case in point. A doctor or a lawyer who can have a reasonable expectation of a six-figure salary and may be able to justify having a six-figure student loan debt. Why? Because of their ability to pay it off is much higher than a school teacher IF they make it a priority and watch their spending in the years after college. But spending $100,000 and taking on $75,000 in debt to get a B.A. in History may be a bad idea. Nothing against history, it’s a great subject to study, but what does someone do with it? I think students need more guidance on how their desired area of study will lead to actual employment and how much they can expect to earn. They are mostly on their own when it comes to figuring that out, and without a good knowledge of the working world, they are sometimes pretty lost. Does your child really need to go to college? Here’s the hard reality: most employers require a college degree to be considered for most positions. 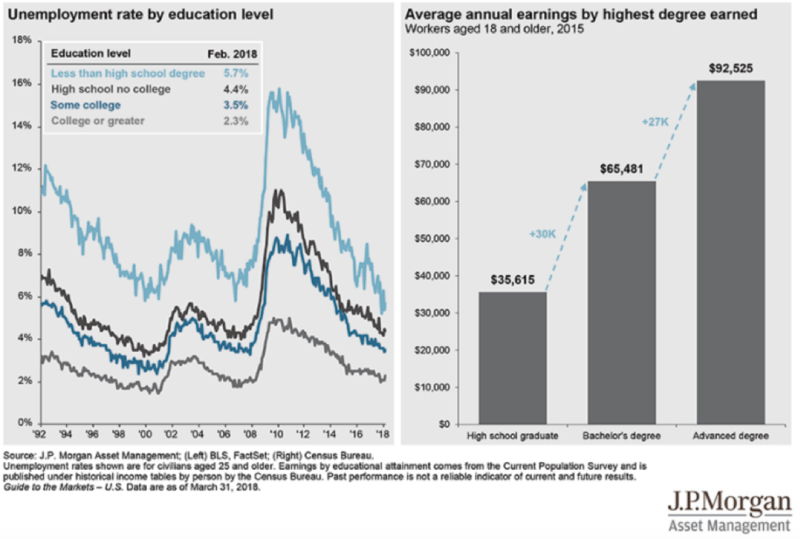 Plus, as the chart below shows, the unemployment rate is much higher for those without a degree than for those who have one. Note the large disparity during the recession of 2008 to 2010. Although everyone was affected, it shows that people without degrees are more “expendable” when there is a significant economic downturn. Some young people may be better off pursuing an in-demand trade skill such as an electrician or plumber. And there are a few who may want to be entrepreneurs. I don’t know about you, but I didn’t have a clue what I wanted to do when I was 18 years old. I changed my undergraduate major at least four times and then got a master’s degree in an entirely different field (and I think I’m pretty typical). I also think it’s unrealistic to believe that an 18-year-old can perform a cost-benefit analysis to decide whether they should go to college or not. Most adults don’t even do that when they make a major purchase. For many families, saving for retirement may mean having to save less than you’d like for college and vice-versa. That said, if you are making saving for retirement your priority, that doesn’t mean that you shouldn’t save for college at all. The first source of funding for college should be financial aid, scholarships, and grants. Another option is saving through 529 Savings Plans. You might think of them as “Educational IRAs.” That because you can save in them 100 percent tax-free as long as you use it for qualifying education expenses. If you use the money for something other than education expenses, you will be subject to income taxes and a 10 percent penalty. Some parents consider using their Roth IRAs as a source of funding since you can withdraw from them without paying any tax or penalties. Think long and hard before doing that since if you use the money for college, you will lose years of tax-free growth before retirement. How can I save money on college expenses? Attend a Community College: An excellent option to keep costs low, especially for students who don’t know what they want to do with their lives, is to go to a local community college for the first two years, get all their necessary studies pre-requisites behind them, and then transfer to a state school to focus on their major. That will help save money and perhaps give the student an idea of an area they’d like to study further. Plus, there are two-year programs that teach a specific skill can lead to employment. Live at home: This may not be ideal from the child’s perspective, but living at home for at least part of their college years can take a big bite out of the total costs. It is a good idea if you have the money for tuition but not pricy room and board and overpriced meals. Statistically, more than a third of young adults between the age of 18 to 30 currently live at home, and student loan debt is the most significant contributing factor. Part-time work and work-study programs: Students can work part-time to help defray costs. Some may even need to work full-time and attend college part-time. It may take longer to graduate, but they will leave school with no debt and a lot of experience in the “real world” to pad their resumes with. Another possibility is federal work-study programs. These offer part-time jobs to help pay for education expenses. The program is structured so that the positions align closely with a student’s area of study. They usually pay at least the federal minimum wage with the possibility of earning, even more, depending on time on the job, required skills, etc.